The combination of glitter in Party Hearty is so obviously Christmas-y that it’s a really easy way to have Christmas nails. You just need to slap a coat over whatever you’re wearing and you’re done. This year I wore Party Hearty over two recent Dior polishes, so I thought I’d share in case anyone is planning their Christmas nails today. First is Party Hearty over Dior’s Lime, reviewed here. It’s a summery green, but I liked how adding Party Hearty toned it down and made it seem suddenly seasonal. Lime still looks a little quirky, but not as bright. This is three coats of Lime with one coat of Party Hearty on top. I find that Party Hearty goes on easily and the glitters disperse well without a lot of fuss, no fishing around required. Next I tried Party Hearty over Dior’s Lady, which is a really frosty white. Party Hearty tamed the frostiness and turned it into a soft glow instead. All of the glitter colors stand out against the white, too, so it’s a nice way to highlight the glitters. It’s so snowy and soft looking, I really liked this combination. This is three coats of Lady with one easy coat of Party Hearty. I love how the gold glitter stands out in this shady picture. Dior’s Lime and Lady are recent releases that are widely available now. 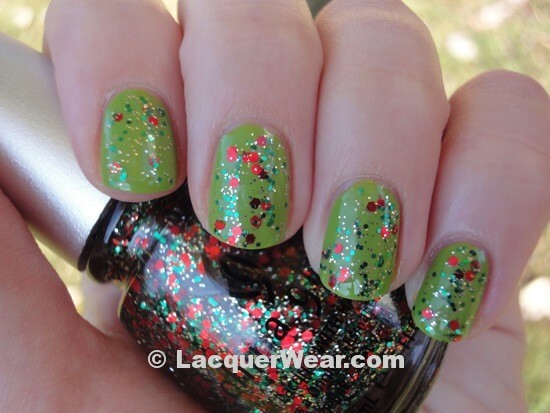 China Glaze’s Party Hearty is from 2010 and seems to be sold out at most places.